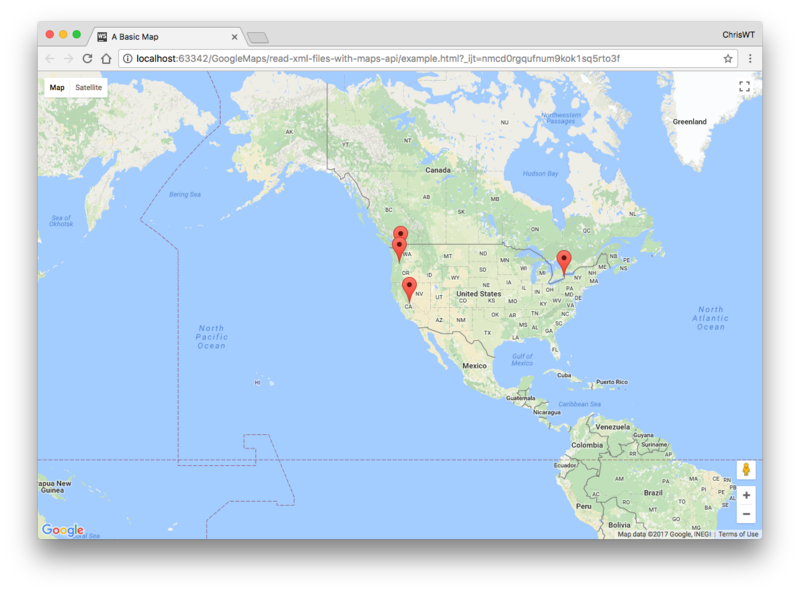 Before you can use Google Maps in your own application, you'll need to get an API key. An API key is a unique series of numbers and letters that a web service provider (such as Google) can use to keep track of who is using their services. Google Maps API keys are free, and use of Google Maps is free for developers. Start with the following basic Google Map. Make sure to replace YOUR_API_KEY in the script tag with your API key that you got from https://developers.google.com/maps. Use a script tag in the head element to include the jQuery library. We'll use jQuery to simplify the process of opening and reading the XML file. Create an XML file containing the latitude and longitude of places you want to display as markers and save the file with the extension .xml. Inside the initMap() function, after the var map = statement, use jQuery to load the .xml file. Pass the xml data into the success callback function. Inside the callback function, create an array of places from the XML data. Loop through each marker and add it to the map. Open your web page in a browser to see the results.